For my formal dining room I went with something a little bit more traditional than my bright cheerful mantel in the living room. I also went with the KISS method this year. That means Keep It Simple, Stupid. Here’s my sweet baby checking out the new decorations. My recipe for a simple, easy dining room decor? I took my big wooden dough bowl that I got at the Country Living Fair and filled it with a big wad of Christmas lights that will likely never be untangled again. Then I poured a bunch of gold and rust colored ornaments all over the top, did some minimal arranging to make it look semi-proportioned. Then I flanked it on either side by two sets of candleholders. I have had the two large ones since my wedding reception centerpieces. I’m still digging them after six years, so that says something about how much I loved my wedding reception. The smaller Drake Firefly lanterns are new, from my Willow House line. If you’re wondering about the cord- here’s how I hid it. 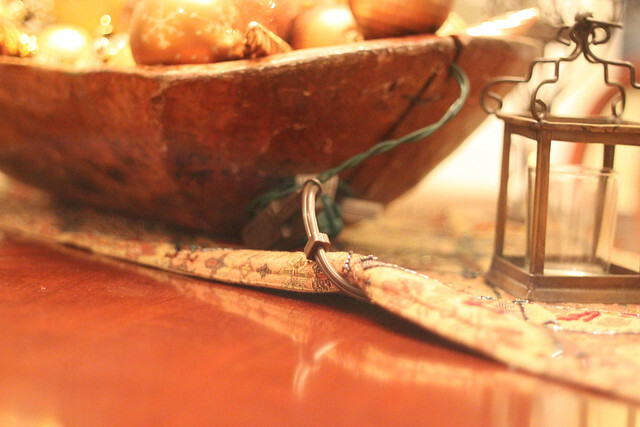 I just tucked it underneath the backside of the bowl and put the extension cord under the table runner. I figure it’s just for looks anyway. When the table gets some actual use I will have to move the bowl to a different spot. 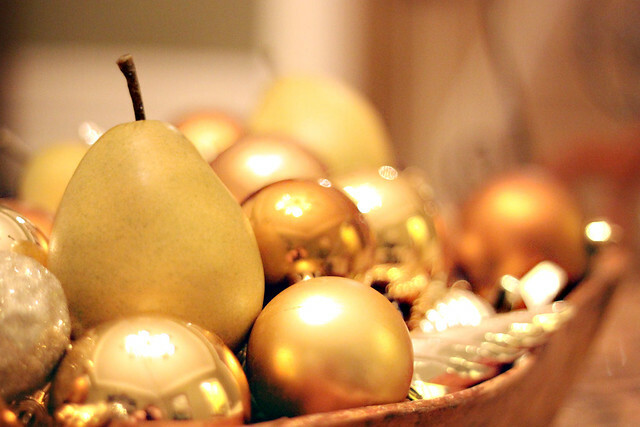 As a finishing touch, I threw in three fake pears that I had lying around from another decorating project. And that’s it! Simple and beautiful. A winning combo. 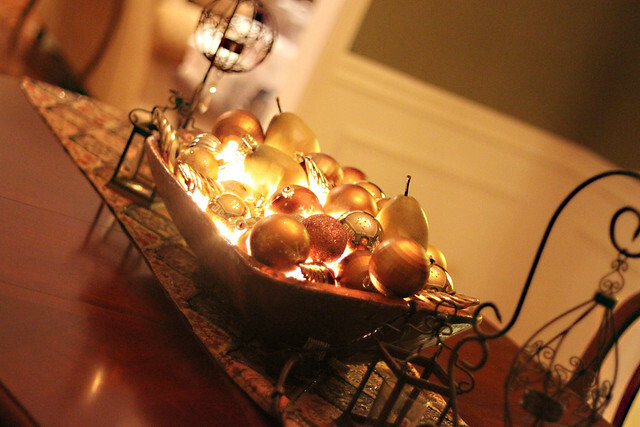 I’m linking up to the Christmas Vignette party over at Rhoda of Southern Hospitality! 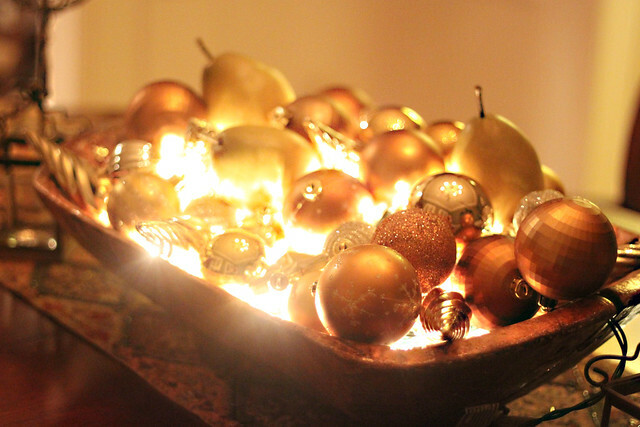 Check out lots of great blogs over there for Christmas inspiration! And if you are just visiting I am giving away three tickets to see Garth Brooks in concert in Nashville! Click here to enter! « GIVEAWAY! Three Garth Brooks Concert Tickets up for grabs! Beautifully done & love the glow! Great capture on that last shot! Magazine worthy! Your dough bowl display is sooooo PRETTY!!! I just started working on mine tonight…still doing some fluffing. I’m hosting a Christmas Open House on 12/9…would love to have you come by and join in on the fun! I love the simplicity of the whole thing. Often I feel like I have to go over the top for Christmas, and this is a reminder that simple can be stunning too! Is it just a tangle of miniature white lights underneath? Like a small strand or just regular old lights? I’m trying to figure how many ornaments it would take to cover a big mess of lights. Cause I got some big messes of lights :). 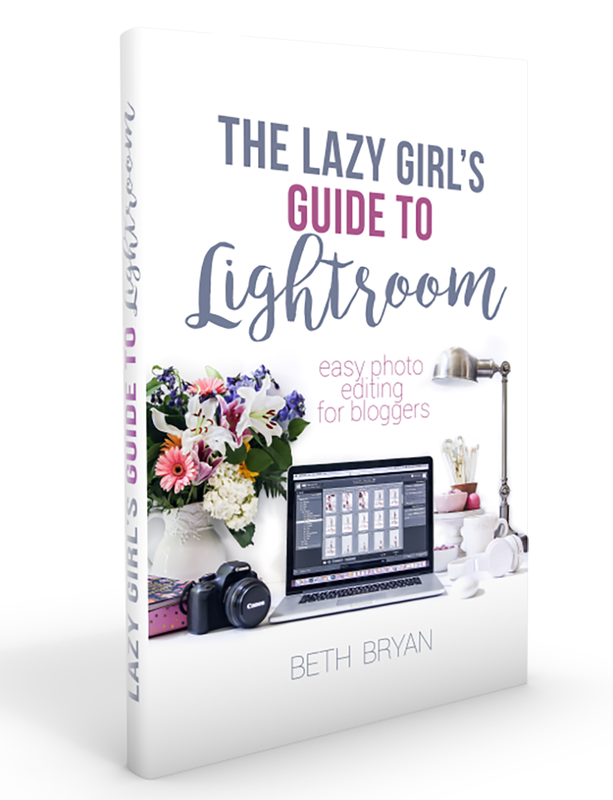 Beth, I love this look, so simple and elegant. Lights just make everything festive this time of year. your pics are great! @NYCLQ- That is such a huge compliment! Thank you so much! @Linda- I will definitely join in! Thanks for the invite! @Pat and Rhoda- I appreciate it! These parties are so much fun! I’m loving it this year. Thanks for hosting, Rhoda! 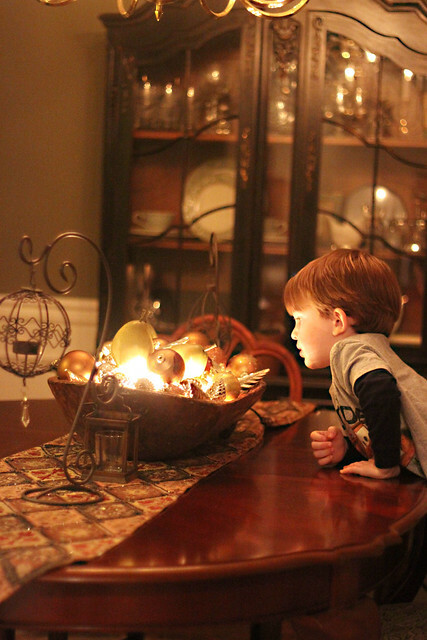 I love this idea as I enjoy soft light or candle glow at Christmastime, but what I love more is the sense of wonder on your child’s face in the first photo. That is what makes Christmas – Christmas! I love the the way the light just glows from the bowl. I used a wooden dough bowl in my vignette too! Very beautiful! I LOVE this clever idea! I never would have thought to put lights in the bowl, but it’s so perfect. Love the pic of your baby too, so sweet! Beautiful! You should definitely link up with us on Tuesday for Home Tour Tuesday…next week’s theme is Christmas decorations. This would be perfect! Thanks for joining the ornament exchange! I love the dining room decor! So simple, yet so elegant. Visiting from the Ornament Exchange and now following! this is gorgeous. And my fave is the glow off of your baby’s face! LOVE the dough bowl. I linked up mine on The Nester’s party too! Stop over and have a look!